At ProLine Striping our team is here to help you meet all your pavement maintenance needs – large or small. We will personally take the time to make sure your project is completed with excellence from start to finish. It is our goal to make the process for our customers as hassle free as possible. Re-striping is simply painting over the old faded lines to freshen them up and make them visible again. Restriping your parking lot is a great way to improve the curb appeal of your business, and help portray a professional image. New Layout is required on new pavement surfaces or old pavement surfaces where there are currently no lines present. Our team will work with you to match the plans you have, or we will help you draw up new plans to best suit your space and meet MUTCD and ADA guidelines. We also offer services to relay out an old parking lot. We have machines to remove the old lines, so we can replace them with a new layout. One of the main issues property owners face regarding the appearance and functionality of their property is the deterioration of their asphalt surfaces. If left alone, over time the asphalt will break down and crack, causing pot holes and liability issues. Once the asphalt has gotten to this point, the only hope to fixing the problem is by repaving large areas of the parking lot, if not the entire lot. One way to prolong the life of the asphalt, and lengthen the breakdown time, is by having the asphalt sealed every 3-5 years with a coal tar or asphalt emulsion based sealer. Sealcoating, when done every 3-5 years, helps preserve and beautify asphalt surfaces it is applied to. Sealcoating your asphalt transforms the curb appeal of your property. The rich black color and the crisp yellow lines highlight the professional image your business wants to portray. Cracks in pavement often lead to asphalt pavement failure. It is important to stay ahead of the cracks so they do not continue to get worse and break down the pavement. 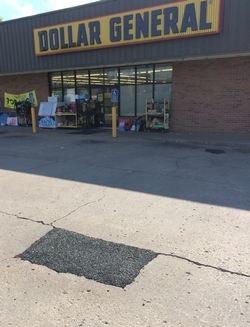 Cracks in the pavement lead to water seeping under the pavement creating a hole under the asphalt surface. As vehicles move across this area a pot hole forms and the asphalt is compromised. ProLine offers a service to fill these cracks and protect your pavement for the future. When ProLine performs sealcoating services, crack filling is usually done prior to the sealcoating. However, crack filling can be done independently without sealcoating. ProLine offers a service to clean out the cracks and fill them with hot, rubberized crack filler to extend the life of the asphalt. Potholes are a problem many property owners face every year. If potholes are not addressed quickly, they have the potential to continually get worse and cause further breakdown of the surrounding pavement. Potholes become a liability issue as they get larger, as well as a pain to customers who drive across them. It is import for businesses to fill their potholes to reduce liability issues and improve curb appeal. Cold Mix Asphalt is a quick, cheap, option to temporally fix your pot hole problems. The pot holes are cleaned out of all debris, filled with the cold mix, and compacted to the surrounding pavement level. Cold mix asphalt can be applied in any weather, rain or shine, hot or cold. Hot Mix Asphalt is a more permanent fix, done by saw cutting a square around the pothole, replacing the asphalt with hot mix, and compacting it to 2-3 inches in depth to match the surrounding pavement level. We provide and install both permanent and temporary signs for parking lots including stop signs, road signs, handicap signs, and no parking signs. 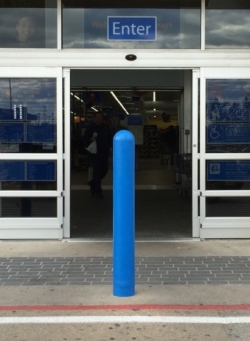 We install any bollard you need to protect anything you place behind them. We also provide bollard and sign combinations to protect sign posts in the middle of parking lots. Most of all, we LOVE striping!